The Barber Institute is just three miles from the centre of Birmingham and is easily accessible by car, bus and train. 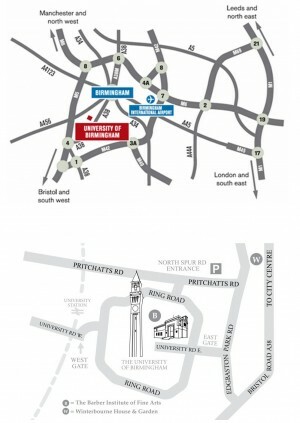 Take the A38 (Bristol Road), turning onto Edgbaston Park Road, where you will see the Barber Institute at the top of the hill on the left, at the main East Gate of the University and facing the road (for all other routes click here). 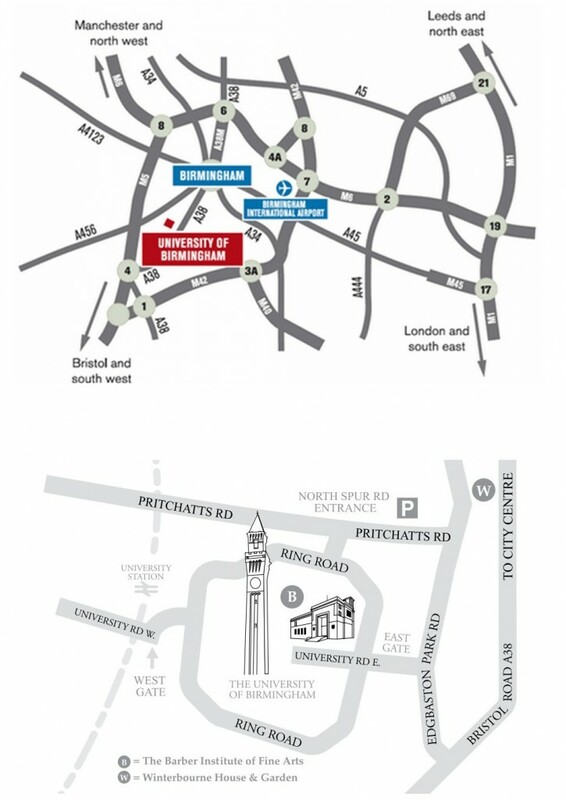 Parking is available in the University’s North-East Car Park, accessed via Pritchatts Road (first road off Edgbaston Park Road to the left, after the Barber Institute – sat-nav postcode B15 2SA) – a five-minute walk away. There are frequent buses from the city centre past the bottom of nearby Edgbaston Park Road (61 & 63 operated by National Express West Midlands), while other services from many parts of the city and region call at bus-stops in the roads surrounding the University campus. More details can be found here. University station is a 10-minute walk from the Barber Institute across the main University campus – turn left on exiting the station and follow signs. Cross-City Line trains leave New Street station regularly (direction Longbridge/Redditch) and take approximately 10 minutes to travel the two stops.